DEAR MAYO CLINIC: Is it necessary to have physical therapy before surgery for a torn ACL? How much physical therapy usually is needed after the surgery? ANSWER: Strictly speaking, physical therapy is not required before you have surgery to repair a torn ACL. But studies have shown that it can be beneficial. Physical therapy after surgery is necessary to restore full functioning, and it usually lasts about 12 weeks. Ligaments are strong bands of tissue that connect one bone to another. 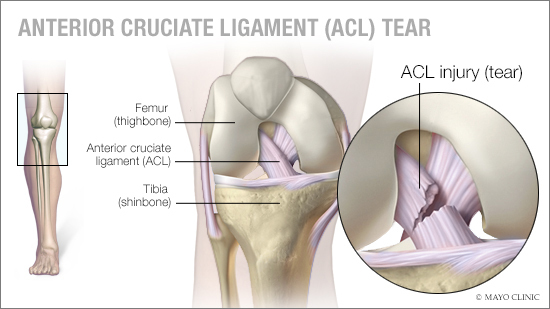 Your ACL, or anterior cruciate ligament, is one of two ligaments that cross in the middle of your knee. It connects your thighbone to your shinbone and helps to stabilize your knee joint. A torn ACL is a common sports injury that often happens during activities that involve sudden stops, jumping or changes in direction, such as basketball, soccer, football, tennis, downhill skiing, volleyball and gymnastics. In some cases, physical therapy alone may be enough to ease the symptoms of a torn ACL, as well as strengthen the muscles around it and restore the knee's range of motion. But surgery to reconstruct the ACL typically is recommended for athletes who want to continue playing sports, as well as for patients who are young and active. Surgery also may be necessary if the injury consistently causes significant instability in the knee joint. Although it's not necessary to have physical therapy before ACL surgery, research shows that doing so can offer significant advantages, especially for athletes who want to return to playing sports after the surgery. Physical therapy before surgery is sometimes referred to as prehabilitation. Its goal is to strengthen the muscle groups in the affected leg in order to increase the chances of a better functional outcome after ACL surgery. One study in particular looked at two groups of patients who had a torn ACL. One group participated in a physical therapy program that involved exercising four days a week for six weeks before having surgery to reconstruct the ACL. The other group did not participate in a physical therapy program prior to the surgery. The study results found substantial improvement in functional outcomes 12 weeks after surgery in the group who completed the physical therapy program before they had surgery. For example, the exercise group outperformed the non-exercise group in the single-leg hop test — a physical evaluation tool that's often used to help guide return-to-sports decisions after ACL injuries. There also was a sizable difference in how long it took the two groups to return to their sports after the surgery. In the exercise group, the average was 34.2 weeks, compared to 42.5 weeks in the group that did not exercise before surgery. These results support the conclusion that physical therapy prior to ACL surgery can be beneficial to the recovery process. To successfully restore stability and function to the knee, physical therapy is always necessary after ACL reconstruction surgery. It involves a program of physical therapy that progresses through multiple phases and typically lasts about 12 weeks. The phases of the physical therapy work on flexibility, range of motion and strength before moving on to assessments, such as the single-leg hop test and exercises that are specific to an individual's sport.